Karan Johar launched Varun Dhawan and Alia Bhatt in 2012 with "Student of the Year" but the actor says it is not essential that they sign every film with the director-producer. Varun and Alia's upcoming film "Badrinath Ki Dulhania" has been produced by Johar's Dharma Productions. "It took a year-and-half to come up (with) 'Badrinath Ki Dulhania'. We did not settle for just anything. We both are in a strong place in our career, we will not do a film just for the sake of it, no matter who is making it," Varun said in an interview. "We share a very comfortable relationship with Karan Johar. If we don't like something we can say no to him. He has kept that option open. But Karan will never offer us anything that is not good enough," he said. 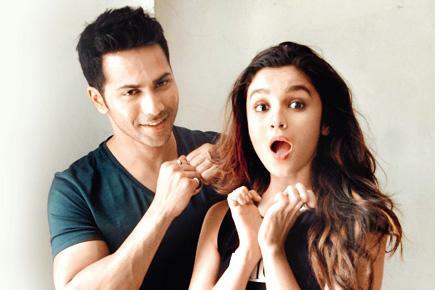 The 29-year-old actor praised Alia for her dedication towards her craft. "She (Alia) won't settle for anything. She wants to make sure everything is perfect and not just with her but with everyone else in the film. There was one scene that we had to re-shoot as she was unhappy. She puts her best foot forward." Varun is hopeful that the audiences will like "Badrinath Ki Dulhania", which is a romantic drama set in the heartland. "Our director (Shashank Khaitan) is from a small town and his way of seeing romance and love story is very different from the way an urban person like me would see it," he said.